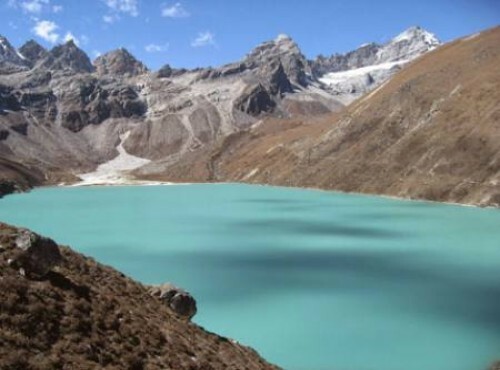 This physically challenging trek may just bring you as close as you will ever come to a real "Shangri-La"! Many trekkers on the popular Annapurna Circuit Trail pass the turn-off to Nar-Phu Valley without ever noticing it, but with this trek, we offer the chance to visit and explore this fascinating and little-visited corner of Nepal. Inaccessible to tourists before 2002, this special place harbors an ancient Tibetan culture that has changed little over the ages. The residents of this sublime, isolated valley rely mainly on farming and yak herding for their subsistence and were never much involved with the Tibetan salt trade. Thus, they were little affected by the closing of the border between Tibet and Nepal following the Chinese invasion of Tibet in 1950. After your arrival in Kathmandu, you may do a bit of sightseeing, but we will be sure to review the trekking gear and clothing needed for a smooth and safe trek. We will also provide the trekking permits required to visit this restricted area. We then drive to the Gurung village of Khudi, where we join trekkers heading north on the popular Annapurna Circuit Trail. We continue on this interesting and well-traveled route until we come to the small village of Koto, which is "where the fun really begins." For it is here that we take a deep breath and leave the comfort of the Annapurna Circuit, present our passes at the police checkpoint, and venture forth into the serene Nar-Phu Valley. We will be trekking alongside the Nar Phu Kola (river) as we make our way northward, first to the village of Khyang, and then beyond, winding our way carefully along a trail carved out of the cliff above the river. At last, we reach the fascinating village of Phu, which means "head of the valley." We will spend a day exploring Phu and environs, perhaps visiting the Tashi Lhakhang Gompa (monastery). We now retrace our steps, trekking south; after passing through Junam, we will take a trail leading westward which we had passed on our way north from Koto. Climbing steadily, we will gain some wonderful views of surrounding peaks, before reaching the large village of Nar, which spreads itself around a basin of barley fields. After a rest day spent exploring Nar and gaining additional acclimatization, we head up to thrilling Kang-La Pass (5,320mt/17,454ft). Weather permitting; our efforts will be rewarded with phenomenal views over the Annapurna. With the Pass behind us, we then head down to the charming old town of Ngawal, where we rejoin the folks on the Annapurna Circuit. We next trek westward to the substantial town of Manang, which offers dramatic views of the summits of both Annapurna and Gangapurna. Still, more excitement lies ahead, however, as we now must cross the notorious Thorung-La Pass (5,416mt/17,769ft) en route to Muktinath. This village, sacred to both Hindus and Buddhists, seems to exemplify the harmonious co-existence of multiple religious and cultural traditions of Nepal. As we near the end of this amazing trek, we pass through medieval Kagbeni on the way to Jomsom and our flight back to Kathmandu, a farewell dinner, and our flight home the next day. Getting the restricted area permit, we begin our trek through the bank of the Soti Khola. Then we climb to the pine forests and walk through. We also cross various suspension bridges on the way. Dharmashala is located near a cascading water fall, which is superb to see. If your physical fitness supports you, then we can walk up to Meta village, which is 1.5 hrs more. Otherwise, we stop at Dharmashala. Overnight at guesthouse. Today, we start the trek to Kyang. First we reach to Meta village and walk up, and then descend to the bridge. Crossing the suspension bridge, we walk through the human less zone, so we recommend you to bring packed lunch from here. When Tibetan refugees had captured this place, they has settled down around this area, which is known as the Khampa settlement. We take rest reaching Kyang. Overnight at guesthouse. Today, we commence our trek crossing the Phu Khola on the way. Walking is really tough through the rocky trail. Gradually, we enter into the hidden and isolated valley. The landscape is really worth to explore. Phu village is popular to explore the Tibetan Buddhist culture with a beautiful Tashi Lakhang monastery, which was built by Karmapa Rinpochhe. It is one of the significant monasteries out of 108 world’s famous monasteries. We are in the higher altitude region and we need to acclimatize to this alpine altitude. So, we take an exploration day and walk around the Phu village. The beautiful and significant Tashi Lakhang monastery is our destination. It is a center of spiritual devotees. There is another Gumba, known as Samdu Choling Gompa. Overnight at guesthouse. After the breakfast, we begin to trek down through the rocky trail, following the bank of the Phu Khola. The trail is full of massive rocks and small pointed rocks that make our trek challenging. We reach to Kyang then Chyako and finally to Junam Goth resided beside the Junam Khola. Overnight at guesthouse. Today, we begin to trek down and cross Mahendra Pul then find the trail that leads us to the Naar village. it is a continual ascending via Yughat. Numerous monasteries and Mani walls are beautiful things to see. Gradually, we reach to Naar village and take rest. Overnight at guesthouse. We spend a rest day in Nar before heading to Ngwal via Kang La Pass (5310m) : It is adventurous but the views of the Lamjung Himalayas, alpine landscape and others can be seen outstanding. Enjoy the day with delicious meal. Overnight at guesthouse. After breakfast early in the morning, we begin to ascend to Kang La Phedi, also known as Jhombu Kharka. Passing various difficulties, we reach to the top of Kang La Pass through the steep notch trail. The views of the charming Annapurna range, including Chulu East, Chulu West, Chulu Central and Chulu Far East can be seen. Then we descend through the steep moraine path, wnjoying the water falls. With a steep descend, we reach to Ngawal and see the flat roofed stone buildings. Overnight at guesthouse. Today, we start the trek to Manang via Bhraka Manang. The monasteries, chhortens and mani walls are prevailed on the route. Manang is a spectacular village with the Tibetan Buddhists settlements. It is fully loaded with the local lodges, shops, restaurants and café. Overnight at guesthouse. After an acclimatizing day at Manang, we head towards the route of Tilicho Lake, splitting from the main trail that leads us to the Thorung Pass. Through the western gate, we descend to the stream and reach to Khangsar after crossing it. It is an ancient village of Tibetan Buddhists and renowned as the last Tibetan village. Overnight at guesthouse. Heading through the newly built trail, we pass a colorful monastery. There are clear two different trails, but we recommend you to take the downward trail. The upward trail goes through comparatively steep and technical route via Kharka and Top of the Col (4970m) and descends to the base camp. The trail we recommend is a newly developed trail that continues to a high crest and finally we reach to the Tilicho base camp. Overnight at guesthouse. Leaving the Tilicho Lake, we reach to Tilicho Northern moraine top and finally cross the Mesokanto La Pass of 5315 meters. The stunning Tilicho peak, Muktinath Himal, Nilgiri Himal, Annapurna I and others are splendid that can be explored from the top. Then we do steep descend and set a camp somewhere on the Chauri Kharka (yak grazing meadow). Overnight at tented camp. We have an easy trail to walk today from the Kharka. First we reach to Kaisang and explore the nearby Nama Phug Caves and then follow the Thini Khola. Passing the ACAP office, we reach the Thini Gaon. The Bonpo Gompa is a great attraction of this village. Gradually, we reach to Jomsom, which is a busy town with an airstrip. According to our itinerary, nest day we fly to Pokhara but you also have an option to take the adventurous road drive. Overnight at guesthouse. Standard hotel accommodation in Kathmandu and Pokhara on a twin share bed and breakfast basis. Trekking Cook and other supporting staff. Staff costs including their salary food, accommodation, transportation, domestic airfare and medicine.. Domestic flights from jomsom to Pokhara with airport tax. Down jacket and sleeping (be returned after trip completion). Guided city tour with world heritage entry permits fees and private vehicle. Trekking Permit and Annapurna conservation entry fees. Lunch and dinner in Kahmandu and Pokhara.